The Visual Editor will read the xsdir file for the user's system and allow the user to create material descriptions by selecting the isotope from the list of available isotopes. 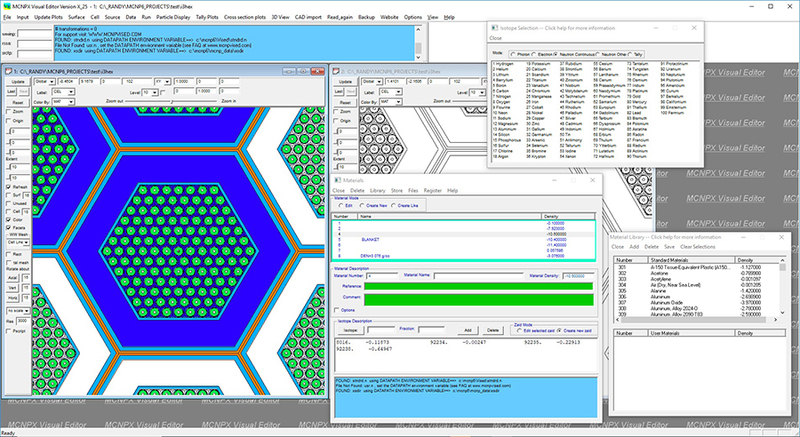 This figure shows the Visual Editor's material creation window on the bottom right. The top portion of the window lists all of the materials that are defined. The bottom portion of the window is used to modify or create new materials by selecting the isotope, which brings up the isotope selection window shown in the upper right, and entering the mass or atom fraction. Once a material is created it can be stored in a library that the user can access in the future to insert the material into other MCNP models. Materials are selected from the cell creation panel, which will pop up a list of available materials for the user to choose from. Each material is assigned a name and a default density. When the material is selected, the default density is used in the cell description. The available isotopes are determined from the xsdir file.